A method to compute three-dimension (3D) left ventricle (LV) motion and its color coded visualization scheme for the qualitative analysis in SPECT images is proposed. It is used to investigate some aspects of Cardiac Resynchronization Therapy (CRT). 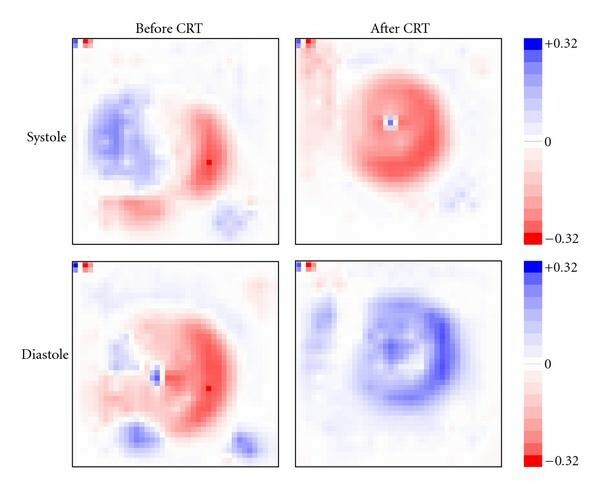 The method was applied to 3D gated-SPECT images sets from normal subjects and patients with severe Idiopathic Heart Failure, before and after CRT. Color coded visualization maps representing the LV regional motion showed significant difference between patients and normal subjects. Moreover, they indicated a difference between the two groups. Numerical results of regional mean values representing the intensity and direction of movement in radial direction are presented. A difference of one order of magnitude in the intensity of the movement on patients in relation to the normal subjects was observed. Quantitative and qualitative parameters gave good indications of potential application of the technique to diagnosis and follow up of patients submitted to CRT. The automatic quantification of dynamic events, like the heart movement, is one of the most challenging applications in the field of medical image analysis. The normal Left Ventricle (LV) wall deformation occurring throughout the cardiac cycle may be affected by cardiac diseases. Thus, some pathological conditions could be identified by the change they produce in the expected normal movement . Ventricular dyssyncrony is an example of a condition that modifies the normal behavior of the cardiac muscle . Cardiac Resynchronization Therapy (CRT) is one of the procedures applied to patients with intraventricular dyssynchrony and aims to restore the normal contraction pattern by the stimulation of both right and left ventricles simultaneously . Several studies have shown the effectiveness of CRT in patients with heart failure [4, 5]. However, among the patients submitted to CRT, 25–30% do not respond to the treatment [6–9] (nonresponder). For this reason, when choosing CRT for a patient, several factors have to be considered. Besides being highly complex, it is an expensive therapy  and implantation of CRT device is not without risks to the patient . The decision of recommending CRT to a patient is therefore a balance of these risks with its potential benefits. At present, there is a lack of specific measures to characterize the degree of synchrony  as well as a factor, which prior to the application of the CRT, can discriminate patients who are going to respond to the therapy from those who are not. A number of researchers have been working to reach this goal in the last years [12–14]. Recently, several studies have used gated scintigraphic images to evaluate the ventricles synchrony by means of phase and amplitude images . However, these two techniques involve a global analysis and may cause a loss of important information about the regional movement of the walls. Electrocardiographic gating of Cardiac Single-Photon-Emission Computed Tomography (gated-SPECT) provides the clinician with a temporal set of 3D images that enables the visualization of the distribution of radioactive counts within the myocardium and surrounding structures throughout the cardiac cycle. It provides the ability to determine the severity of abnormalities in wall motion and wall thickening associated with myocardial dysfunction . A number of techniques have been used in order to describe and quantify the nonrigid motion of the cardiac structures. Among these techniques, Optical Flow methods are used to accurately model nonrigid motion present during the cardiac cycle so that a one-to-one mapping is found between each voxel of two gated volumes [16, 17]. In previous works, we have described cardiac motion by means of the velocity flow field. The velocity estimation for each voxel in a volume was based on Optical Flow techniques . In this technique, 3D LV motion is described by a series of 3D velocity vector fields computed automatically for each voxel on the sequence of cardiac volumes. The analysis and even the visualization of the velocity field in a cardiac volume are extremely difficult tasks, due to the high amount of information presented simultaneously. To make this bunch of information useful for diagnostic purposes, it is necessary to find compact and friendly representations for it. In this work we propose a color coded visualization scheme for the qualitative analysis of the velocity components, with the definition of three movement directions. The coded velocity information obtained from Optical Flow in SPECT images is used to assess some aspects of CRT. In particular, we investigate the ability of velocity derived measurements to assess the effectiveness of CRT and velocity patterns that might be able to distinguish responder patients from the nonresponder, before the application of CRT. The assessment is performed on sets of images from thirty normal subjects and sixteen patients with idiopathic dilated cardiomyopathy. In this section the proposed methods to compute (Section 2.1) and analyze (Section 2.2) the left ventricle motion are described. In Section 2.3 the image acquisition protocol and data sets used for methods evaluation are presented, as well as the criteria used for classification of the patients as responders or nonresponders to the CRT. where the first term is the OF constraint, the second is a measure of the Optical Flow field smoothness, and is a weighting factor that controls the influence of the smoothness constraint. Ex, Ey, Ez and Et are the image derivatives in the x, y, z and t directions; u, v and w are the components of the local velocity vector v along the x, y and z directions, respectively. where , , and are the mean velocities in each direction, for the voxels in a neighborhood of a given voxel, and n is the iteration index. Generally speaking, the heart can be described as a nonrigid object that deforms throughout the cardiac cycle and has very complex mechanical properties . To simplify the analysis of the left ventricular movement, it can be described in terms of contraction/expansion and torsion. In order to qualitatively evaluate the movement of the LV, three movement directions were defined, each with two possible orientations. These directions are depicted in Figure 1. Radial movement is described as a contraction towards the center of the LV during systole and as an expansion from the center during diastole. Horizontal rotation represents the clockwise and counterclockwise movement of the cardiac walls and the vertical rotation represents the movement towards the base (upwards) during systole and towards the apex during diastole. For the apex, only the radial component, which is the major component of its movement, is analyzed. The solution to the algebraic linear system presented in (1) gives the values of the velocity components for each voxel of the cardiac volume in Cartesian coordinates. However, the spherical coordinate system is a more suited system for the description of the movements presented in the former item. For this reason, the visualization module first performs a transformation of the velocities obtained in x, y, and z directions to the unit vectors in the directions in the spherical coordinate system (Figure 2). 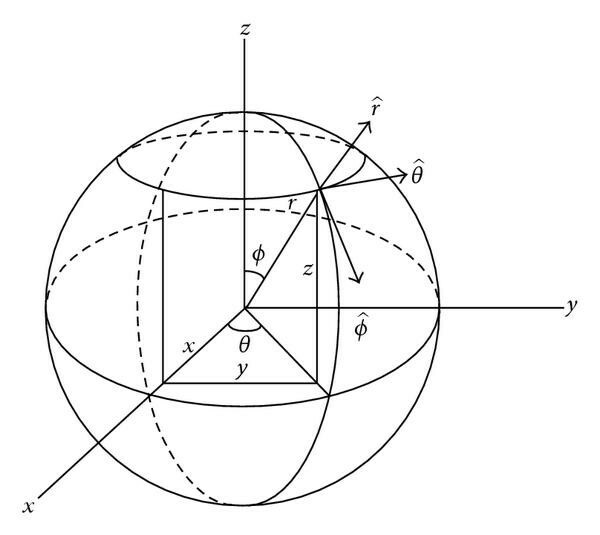 Unit vectors in spherical coordinates. The radial movement can be described by the unit vector for the component, the horizontal rotation by the unit vector for the component, and the vertical movement by the unit vector for the component. The center of the spherical coordinate system is essential when representing the left ventricular motion, as the origin is the reference point for the motion. The results for the velocity components are going to be highly dependent on the choice of this point. How to choose the center of the left ventricle is not a simple task. The anatomical center or the center of mass might be used as a central point, but this choice would fail to find the center in images from patients with myocardial infarction or any disease in which the counts are decreased at certain regions of the cardiac muscle. In this work, the center is defined as the geometrical center of the LV and is selected manually by a trained physician. A desired feature of the visualization scheme is that all information concerning a movement direction be presented in a single image. Thus each image must present information about the orientation and the intensity of the velocity component. The color coding scheme is therefore defined as following: for each component, the color assigned to a voxel indicates the orientation of the movement, being either positive or negative, and the strength of the color indicates the intensity of the velocity vector in this direction. Vertical rotation: downwards motion is positive, and upwards rotation is negative. In order to indicate velocity intensity, a discrete lookup table is used. In this table, the absence of motion is depicted as white, positive values are depicted as blue, and negative values are depicted as red. The positive and negative colors are divided into 128 steps by changing their saturation, such that strong movement is represented by a strong color, and a weaker movement has a lighter color. Figure 3 shows an example of a color scheme, in which the color variation follows a linear scale. Logarithm scales can be used for better visualization of weak movements. Color scheme for presenting information on both the intensity and orientation of the velocity: orientations with negative values are red, and orientations with positive values are blue. The faster a movement is, the stronger the color that represents it will be. The method was applied to 3D gated-SPECT (99mTc-MIBI) images obtained from sixteen patients with idiopathic dilated cardiomyopathy, chronic heart failure in New York Heart Association functional class III or IV, LV Ejection Fraction 35% and left bundle branch block (QRS 120 milliseconds), referred for implantation of a CRT device. The proposed protocol was approved by the Ethics Committee of the University of Sao Paulo Medical School and an informed consent was obtained from all study subjects and/or their families. The image acquisitions were performed at the Nuclear Medicine Department of the Heart Institute (InCor) HCFMUSP. All acquisitions were performed after the intravenous injection of 10 mCi of [technetium-99 m] sestamibi at rest in a dual-head rotating gamma camera (ADAC Cardio-MD with a LEAP Collimator). The acquisition process is synchronized with the electrocardiogram and the cardiac cycle was divided into 8 frames/cycle. A total of 64 projections were obtained over a semicircular 180-deg orbit. All projection images were stored using a , 16-bit matrix. The transverse tomograms were reconstructed with a thickness of 1 pixel/slice (6.47 mm). The volume of transverse tomograms was reoriented, and sets of slices perpendicular to the long axis (short axis view) and of slices parallel to the long axis (vertical long axis view and horizontal long axis view) were created. For each patient the images were acquired in two different conditions: at rest and after pharmacological induced stress. From the group of sixteen patients, eight were responders to the CRT (Group1), and eight patients were nonresponders (Group2). For each patient, the rest and stress data sets were analyzed before to and after CRT, respectively. This gave a total of 64 gated-SPECT data sets included in this analysis. Before the implantation of the CRT device, the clinical condition of the patients was assessed and they were subsequently scanned with three different image modalities: gated-SPECT, echocardiography, and gated blood pool imaging. The aim was to gain an estimated left ventricular Ejection Fraction (EF) from each image modality, for later use as a quantitative measure of the response. After a three-month follow-up, the patients were submitted to the same procedures as prior to CRT. The majority of patients improve immediately their EF or functional class post-CRT implant. Estimates of the EF from each image modality were acquired a second time and compared with the estimated baseline EF. A positive response to CRT was defined as an increase of at least 5 percent points in one or more of the three modalities in addition to a positive clinical assessment. Patients who showed a positive response are named responders, and the ones who did not are named nonresponders. The method was also applied to image sets of thirty normal subjects (The normal subjects whose images were used in this work were part of a Research protocol approved by the Ethics comittee of the University of Sao Paulo Medical School. ), whose acquisition protocol is the same as the one described for the patient images. By analyzing normal left ventricles, the resulting visualization of the motion patterns can be compared with the motion expected from the heart physiology (seen in Figure 1). As an example, Figure 4 shows the results obtained for one normal subject using the velocity color coding scheme. The Figure depicts the velocity images for the three movement directions in a slice from the midcavity portion at both diastole (line 1) and systole (line 2). Column (a) presents the images of the radial component, column (b) presents the images of the horizontal rotation component, and column (c) presents the images of the vertical component. The color table used in Figure 4 (as in the remaining figures of this text) is adjusted to the maximum value of each map. Velocity images of a normal subject in a slice from the midcavity portion of the LV. Line 1 presents diastolic images and line 2 presents systolic images. Column (a) depicts the images of the radial component. The several tones of blue in the myocardium in Line 1 represent the expansion while the tones of red in the same region in Line 2 represent the contraction. Column (b) presents the images of the horizontal rotation component. The tones of blue represent counterclockwise rotation while the tones of red represent clockwise rotation. Column (c) presents the images of the vertical component. The tones of blue represent downward motion while the tones of red represent upward motion. The color scale is shown at the top right of the figure. During systole, as the left ventricle ejects blood, the myocardium contracts starting at the apex and moving upwards to the base. Simultaneously, the septal and lateral walls move towards the center of the left ventricle. Therefore, the expected result in systole is the contraction which is presented in the Figure 4, line 2, column a. In this image, the contraction movement is represented by different tones of red, indicating the contraction with varying intensities. After ejection the heart enters the diastole, where the overall motion is opposite of the contraction. The expected colors are therefore also the opposite of the ones observed in systole. The results of a normal wall behavior can be observed in Figure 4, line 1, column a, where the expansion movement is depicted as different tones of blue. The analysis of this movement is quite complicated. If one studies the anatomy and physiology of the subepicardial and subendocardial myofibres during both systole and diastole, it would be expected that images would show opposite rotations in the outer and inner sides of the myocardium. This could not be seen in any of the slices of any subjects. Instead, it seems like different rotary motions govern at different parts of the myocardium. The results in the midcavity slices form four corners, where opposing corners have movements with the same direction (see Figure 4, lines 1 and 2, column b). This pattern was similar in all normal left ventricles, hence it was assumed as the normal pattern in the horizontal motion. The results obtained show the expected opposite relationship between systole and diastole. In the ejection phase, the apex is pressed upwards during contraction to force the blood out through the aortic valve. The expected result of the vertical rotation in systole is therefore an upwards rotation, which is coded as red, this is also seen in Figure 4, line 2, column c. In diastole, the images show movement in the opposite direction. In both groups of patients, the dyssynchrony of the movement can be observed in the radial movement. After CRT, Group1 should achieve an improved synchronization in the radial motion. This can be seen in most of the analyzed patients, where improvement in synchrony between septal and lateral wall is detected in both systole and diastole. Figure 5 shows an example of such a patient. Radial motion of a Group1 patient. A slice from the midcavity is shown in systole and diastole, before and after CRT. In systole before CRT, the arrows indicate the septal and lateral walls. It can be noticed that in the septal wall, pixels present positive values—blue color—while in the lateral wall they present negative values—red color. The expected normal movement would be an overall contraction of the walls, represented by red color. Such movement can be seen in systole after CRT. The arrows in the figure indicate the global contraction movement depicted in tones of reds. The color scale is shown at the top right of the figure. Prior to CRT a dyssynchrony is present in form of a blue (expanding) septal wall and a red (contracting) lateral wall. In the image after CRT, an improved synchrony is visible; here the blue color in the circle is replaced by a weak red color. During diastole in Figure 5, only the lateral wall is expanding before CRT, as the septal wall was expanding in systole. After CRT a more synchronic expansion is detected. It is seen that the overall intensity of the movement is weaker when compared to the normal subjects. The analysis of synchrony in the Group2 showed that there was no improvement in most of patients, as expected. The images obtained before CRT present patterns quite different from the one assumed as the normal pattern. However, most of the results for Group1 after CRT are like the pattern found for the normal left ventricles; an example is shown in Figure 6. The example in Figure 6 further shows that the desired opposite relationship between systole and diastole is present. Horizontal motion of a Group1 patient. A slice from the midcavity is shown in systole and diastole, and before and after CRT. A movement pattern similar to the normal is seen after CRT in both systole and diastole. The color scale is shown at the top right of the figure. For Group2 no such pattern in the horizontal rotation was detected. One patient showed a pattern similar to a normal pattern in systole, but a worsening in diastole, while others showed the opposite or a mixture of rotations. None of the patients had a similar pattern of improvement or deterioration in synchrony. The intensity of motion was similar prior to and after CRT in all patients in systole, but in diastole half of the patients had a high intensity in horizontal rotation before CRT, which decreased after CRT. This behavior of noticeable decreased velocity intensity values was not detected in the Group1. Vertical rotation in a Group1 patient. Middle slices shown during systole and diastole before and after CRT. The pattern is similar to the normal pattern before and after CRT as well as in systole and diastole. The color scale is shown at the top right of the figure. Table 1 presents the normalized mean velocity values for the radial motion of the anterior, inferior, septal, and lateral walls (Figure 1(a)) for the LV midcavity portion. It presents the values found for one normal subject and one patient of each group (responder and nonresponder). Mean intensity values for radial motion of one normal subject and two patients, one of Group1 and one of Group2, before and after CRT. Values presented for the walls depicted in Figure 1—anterior, inferior, septal, and lateral—for the LV midcavity portion. The computed intensity values are mapped to a scale that allows a maximum of and a correspondent minimum of . Diast: values in diastole; Syst: values in systole; Expected orientation of the movement: + is expansion and – is contraction; Group1 before: responder patient before CRT; Group1 after: responder patient after CRT; Group2 before: patient nonresponder before CRT; Group2 after: patient nonresponder after CRT. The comparison between patients (Group1 and Group2) and normal subjects shows that not only the synchrony of the movement is compromised, but the intensity is seriously decreased in this set of patients, which reflects the impaired heart function. The numerical values representing the quantity of movement of the normal subjects are ten times higher than the patients. Although this quantity does not change considerably before and after the CRT, the responder patient presents an overall increase in the clinical conditions due to the fact that the synchrony of the movement has been restored. This fact can be seen in Table 1 by the change in the expected sign for the measurement. Patients from the Group2 did not present this improvement in synchrony. The analysis of the velocity field from cardiac volumes can give important clues about the dynamic events occurring during the cardiac cycle, which may help to understand how some treatments improve heart function. In this work, the results were presented in a slice of the short axis view and we proposed a scheme for displaying the wall movements which are displayed using a compressive color code that integrates orientation and intensity of the velocity vector at each voxel. The most important feature of this method is its capability to evaluate LV motion in a more comprehensive way since it allows a regional analysis by assessing the movement in three predefined directions. Other techniques (like echocardiography and phase images derived from Fourier transform of radionuclide ventriculography or even gated single photon emission computed tomography) use previously defined points (or regions) and establish a comparison between them or evaluate indices that characterize global LV synchrony [2, 7, 10, 19]. In this study, the results from the normal subjects were used as the reference for normality in each of the directions. The representation of the velocity components in a color coded image has shown to be an efficient tool for regional inspection of the LV wall movement that could improve the optimal site of LV electrode implant. Actually, the method allows a local analysis, since the results are obtained for each voxel of the volume. This is an important advantage of this method when compared to other global techniques such as phase and amplitude. Table 1 shows a quantitative comparison of one data set obtained in normal controls, and two patients, one who responded to CRT and one nonresponder. A difference of one order of magnitude in the intensity of the movement on patients in relation to the normal subjects was observed. 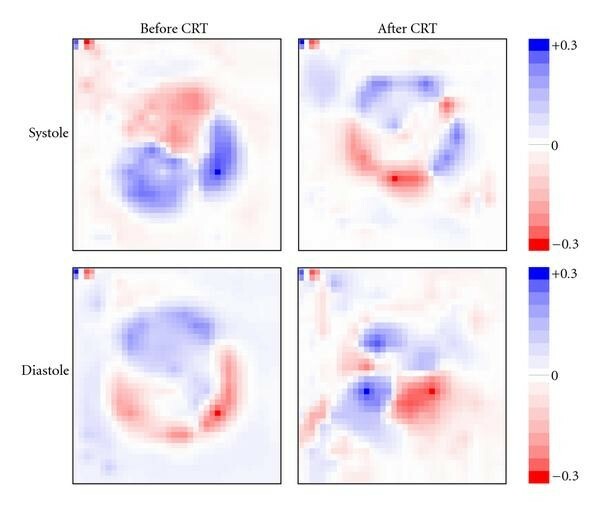 The evaluation of radial motion before CRT in a nonresponder patient (group 2) showed a movement pattern different from normal in both phases of the cardiac cycle. The responder (group 1) showed motion in the opposite direction from normal controls only in inferior and septal walls. This fact could suggest that responders are different from nonresponders before therapy. After therapy, the direction of the motion of inferior and lateral walls of the nonresponder became similar to normal controls, but not the direction of anterior and septal walls. The group 1 patient showed a normal motion pattern except in inferior wall after therapy. The qualitative and quantitative parameters obtained with this method could add information to a better selection of patients who would respond to TRC and provide a measurable tool to the follow-up in this population. the spherical coordinate system was chosen for calculating the orientation and intensity of the left ventricular motion. A key issue to the proposed scheme is the center of the spherical coordinate system since it is the reference point for the motions and therefore essential in the visualization of the velocity components. A change in center will influence both the intensity and orientation of the left ventricular motion. Choosing the center is difficult as it should be the exact point or axis from which the motion starts and ends. In the present work, the center was determined manually by a trained observer as the geometrical center of the LV. Another limitation is the poor resolution of SPECT images that sometimes makes it difficult to analyze the movements. It must be added, however, that the proposed method is not applicable to nuclear medicine imaging only and can be extended to other modalities. the results are preliminary indications obtained via a qualitative assessment. 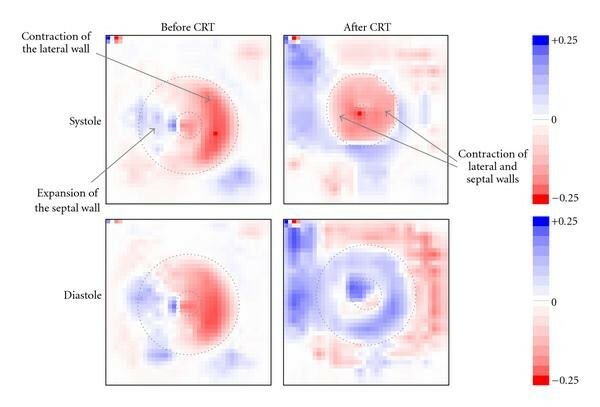 Quantitative indexes can be created based on these images that would be able to quantitatively assess both the effectiveness and prediction of CRT response. These indexes could be based on the creation of normal distributions of the velocity field for each direction. An alternative and elegant approach for defining quantitative tools for the analysis of the movement patterns is the creation of a functional bull's eye [20–23]. Once the bull's eyes of the described movement patterns have been built, many studies can be performed for the assessment of the patient's condition. In order to find an index to predict response to CRT therapy, extensive clinical studies must be performed and involve the acquisition of a statistically significant number of images from normal subjects and patients. In this study, the left ventricular three-wall movements were studied using a compressive color code that characterizes the integration of orientation and intensity of the velocity vector at each voxel. This new technique of myocardial synchronization assessment might be able to distinguish responder patients from the nonresponders and improve the follow up of patients who underwent CRT. The authors would like to thank Dr. Ramon Moreno, Maurício Higa, and Carlos Santos for their valuable discussions at the elaboration of this work. This work was supported in part by the Foundation of Aid for Research of São Paulo State (FAPESP) Grant no. 2006/06612-4, the National Council for Scientific and Technological Development (CNPq) Grant no. 300499/2005-1, the National Institute of Science and Technology—Medicine Assisted by Scientific Computing INCT MACC, and the Zerbini Foundation.